Tomorrow is butchering day. We have a steer, Chester, who is actually only a half-steer. That's my fault -- I did a lousy job with the banding -- and as a result this randy fellow has been happily coasting around with our young heifers, who aren't old enough to breed yet. So he's going in the freezer, even though he's pretty young. This isn't a difficult decision. Steers always have a date with the freezer. It's just a matter of when. However something happened this week that caused Don and I to add another animal to the freezer list, and that's one of our herd matriarchs, Ruby. We got Ruby and Jet shortly after we arrived in Idaho, when they were about nine months old. Right now these ladies are about eleven. Both have horns, and both have very different dispositions. From the start Jet has been very sweet and mostly gentle. From the start, Ruby has been an absolute pisser. She's very much the dominant animal on our farm. Nonetheless I milked her and Jet for several years, and she has faithfully birthed a healthy calf every time she's bred. She's an excellent mother and produces beautiful calves, which is why we've put up with her for this long. ...while the rest of the herd makes do with the feed by the other fence. This demonstrates how much our animals are held hostage to Ruby's dominance. Then something happened this week which made me mad enough to spit nails. I was feeding the cattle in the morning in the feedlot. Parts are still pretty muddy from the winter snowmelt, so the cows have to pick their way to dry ground. As usual Ruby came along and swept everyone from her path under the awning as she searched for the choicest hay. One of the cows she swept out of her path was Polly, our purebred Jersey. Polly lunged away from Ruby, tripped, and got momentarily mired in the mud and couldn't get up. Instantly Ruby was on her, attacking Polly as she lay helpless on the ground. I leaped into the feedlot and started whaling on Ruby with the back side of the pitchfork. Startled, Ruby broke off her attack and this gave Polly the chance to start heaving herself to her feet. But then Ruby went after Polly again, so I continued whaling on Ruby until Polly had a chance to get away. To say I was furious is an understatement. Poor Polly has a scarred backside from putting up with Ruby's temper. The last thing she needs is to be gored by a mean cow. So after discussing it with Don, we called the mobile butchers and asked them to add a second animal to dispatch when they come to our farm. Enough is enough. Yet I am not at peace with this decision. Butchering Ruby will leave little Alice orphaned, always a sad situation. Alice was born in June and is now ten months old. She's plenty old enough to wean, but it will be hard on her at first. Yet butchering the steer, Chester, will deprive his mother Raven of her calf... and I'm not having bad dreams about this decision. We need to do what's in the best interest of our farm. I know butchering Ruby is the best thing in the long run and will make life much more peaceful for the rest of the critters, but I confess I've been having nightmares (literally) about it. I've been walking around with a knot of dread in my stomach for the last couple of days. This is one of the few butcherings I won't attend. I plan to head into town tomorrow morning and hang out someplace until the deed is done. It's hard to say goodbye to an animal we've had for ten years, even if she's a bad-tempered twit. Tomorrow the rest of the herd will be singing "Ding Dong the wicked witch is dead" and they will be asking you "What took so long". I understand what you are going through. It is one of the hard decisions one has to make living our lifestyle. Ruby had a very good life living with you; one she probably would not have had otherwise. That is what you have to think about. Yeah, it is hard. But her death will be quick and without fear, unlike the millions that go to the slaughterhouse. Some animals are just buttholes. We had a steer that would chase the others away from the water trough even though he didn't want a drink. He went into the freezer right quick. Howsomever, experience says that it'd be just a matter of time until the one getting swept out of the way was you, or it happened when you didn't have a pitchfork at hand. Even de-horned she'd pose a growing danger as she aged. You're doing what has to be done. It's completely understandable you feel the way you do, and I'm wondering if, if it's still an uncomfortable thing for you post-processing, if you've considered possibly donating the meat. It seems pretty significant that you've had nightmares and a tight gut about it. I don't ever remember you saying such a thing. Even when Don was feeling poorly. (Sorry Don....now that I read that back I guess it does sort of seem like a comparison in which I give you the tail end...lol...) It's clear this is a hard thing. It's good you're going to town. I was in a gut grip as I read of Polly's involvement, and read each next word and line with a growing sense of dread and unease. I'm deeply thankful it ended as soon and as well as it did. Prayers up from here for your peace of mind and heart....and safety. Actually yes, we plan to donate a lot of the meat. At ten years old, she won't be worth much more than ground beef and roasts. Most of the ground beef will be donated to our church's food pantry. I'm glad to hear it. Even at that age, your grass fed beef will be a major blessing to a lot of folks. Once it's done and you see the harmony in your farmyard you will feel much better. Homesteading comes with tough choices, but it's always worth it. I feel for you, but totally agree and understand your decision. My best milker (and the matriarch of our goat herd) was gored in the udder by another horned goat just last month. She lost her udder and almost her life because of the blood loss and subsequent infection. I swore to never have horned goats, but she came up and I bought her, now I regret the decision. The horned goat is in the sale paper and had a rubber hose "U" around her horns now. At our farm, there is no place for dangerous or overly aggressive animals. I know this was not an easy decision to make, but based on what you have said about her, it is the best one you can make. The attack on Polly pretty much sealed her fate. You are protecting the rest of the herd, and while this was not a pleasant choice to make, for what it is worth, you are doing the right thing. Sounds like you are doing the right thing. Try to think positive. You will enjoy seeing the rest of your herd finally having a peaceful meal.....best wishes! The harsh realities of actual life, not the sanitized life most people like to believe is real life. "Bad-tempered twit"....woman, you crack me up. Sounds like the decision was correct even if the implementation is difficult. I have raised lots of animals of different kinds. Rabbits for the longest time, and we all used to say 'a bad tempered rabbit eats as much as a good tempered one' and the bad ones went into the stew pot! Same with cows or sheep. I even had a dog who was pretty untrainable. Great watch dog, but too agressive and when it came time to call it quits, I did the deed myself as he was MY dog. I am sure you will have a cry, like I did, and your barnyard will be a more peaceful place. Don't discount the meat though, grass fed old cow can still be mighty tasty and more tender then you think. Hug! I am so sorry. That is a difficult decision for sure. I do not envy you in the least for this. She will contribute nicely to the church though and the best motto for farm animals is, "You're friendly or you're food." Sam I Am, love that motto, I'm going to have to steal it! That's been our attitude, we're not tolerating a mean animal. I understand you'll always have some aggression from an uncut boar and a pecking order with chickens and goats, but when one is over-board, into the freezer they go. ...even if it is an evil-tempered old cow. I can feel your pain. It is always hard to kill just about anything but sometimes you have to do what is the best for the herd. I can remember back on the farm when growing up having one cow butchered and she was a sweet one but you have to eat. I think that donating the meat to the church is a good solution for all concerned. I'm sorry Ruby has put you in this position, but I can say the other animals live daily with her bullying them and causing them stress and injury. It's still difficult for you and as I wrote, I'm sorry. I once was pushed to sell a show horse of my daughters, a real all around easy to ride push button show machine, and a drop dead gorgeous one at that. She was a bully and never missed an opportunity to kick another horse. She cornered my littlest child's sweet grade mare in the corner of the barn and went to work on her and when the little mare finally escaped with my help, the big bully mare went after her again and knocked her down and pummeled her some more. It cost me $800 in vet bills. It was either sell all of the other horses, or her. I was so angry I sold her at auction even though I knew I would take a big loss. (I did tell everyone that test rode her that she was top mare and always let the others know it). Life was easy for the other horses from that point on, they lounged where they wanted, drank when they wanted and I didn't have to spread hay from here to kingdom come to insure they received some. Eliminating the barn queen made life so nice...and safe for all. I pray you will see the benefits of your wisdom immediately. I wouldn't feel bad. If she's that dominant and will go after one of the others, wouldn't put it past her to gore one of her people. Pass the charcoal and start the grill. Crimes against the peaceful kingdom present difficult choices. I'm so sorry. I was really hoping the story with Polly turned out as it did. I was afraid to continue reading and find out that Polly had been gored by Ruby. I kept thinking to myself "NOT POLLY!" Though this is no comparison to your dilemma, I want to share: I once had to catch a feral cat who was terrorizing my pet cats. My felines are more than pets, they serve a function, too. This feral tom sent one of my neutered males to the vet 4 times ($100 each time), and then killed one of my spayed females. We had to catch him. We did, and then took him to the Humane Society. Don't know what happened to him. Don't want to know. I was incensed beyond reason that he had reign over my little farm like he did. I hated having to condemn him the way I did. I hated it. I know I'm late to the party but you you made the right decision. I believe you were upset because you made the decision to butcher her when you were angry - and justifiably so! She was obviously becoming more aggressive and bold. She let you see the attack on Polly, imagine what happened in the pasture and barn when you were not looking. Cook the beast! I grew up on a small beef farm in NE Indiana and we had to make that call twice. One was for a Hereford-Holstein cross bull and one for 'red-eyed' polled Hereford cow. The last straw for the bull was when he pinned me up against a wooden gate. I fit between his horns (I was a teen and MUCH skinnier then) so the gate took the brunt of it and I got away with nothing more than bruises and scrapes. I think he became mostly hamburger. It was harder with the cow. She was a classic polled Hereford with the exception of one red ring around her left eye. She was an easy calver and had nice calves (all with a red ring around their left eyes), but had a difficult disposition that got downright dangerous right after she calved. 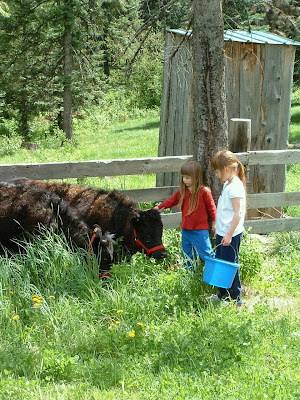 When one of her new calves (maybe her 6th or 7th) needed some attention we had a VERY difficult time taking care of it. That was the last straw. She went "up the chute" instead of in the freezer, but it was still hard to let a cow that produced good calves go. As a side note, everyone of her red-eyed calves had some of their Mama's disposition and trait even carried on to some of her "grandkids". Just discovered your blog and thought I'd stop in to say "Hi". My motto: Life is too short to put up with unruly livestock. Over the years this has included horses that seemed to enjoy dragging our children off under tree limbs, cattle / goats that wouldn't stay in their fenced areas (with good fencing), chicken killing dogs, roosters that terrorized children, etc. I really like the farm animal motto above: "You're friendly or you're food!"